Sorry this post is a bit later than usual today. I was at my dd's kindergarten class for their Christmas party. (I'm so glad there are schools left in America that allow Christmas parties. Gotta love the South.) Anyway...here's another gift idea for neighbors or friends that we gave out last year. 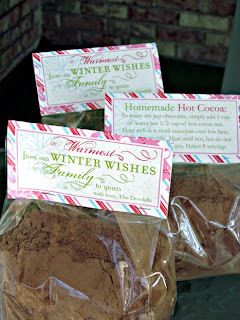 These clear cellophane gift bags are full of homemade hot cocoa mix, and I made the treat toppers using Natalie Malan's awesome Sugar Cookies tag making kit available at pcLayers.com. Come back and I'll try to have the recipe and instructions available...and maybe even a freebie to give away! Nice gift idea! Can you share your recipe? I like your gift toppers. Thanks for sharing all your great ideas!